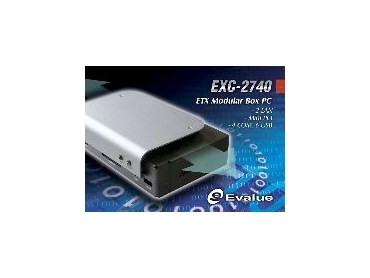 EVALUE has recently launched the EXC-2740 small form factor computer system based on Intel Pentium M/Celeron M core. Housed in a rugged extruded aluminium enclosure at only 249mm x 155mm x 67mm, this micro system uses passively cooled low power Intel Pentium M 1.1GHz and Intel® Celeron M 600MHz processors respectively depending on customer’s requirement. It can operate up to an ambient temperature of 0-40°C without the use of any fan. The ECX-2740 is designed for general purpose by merging complete functions including 5.1 channels AC97 audio, dual 10/100Mbps Ethernet controllers along with additional I/O expansion with six high-speed USB 2.0 ports, four serial COM ports and one parallel interface. The onboard Intel’s Extreme Graphics 2 chipset with embedded 64MB SGRAM provides unprecedented graphics performance that includes selectable 16:9 aspect ratios for high definition TFT LCDs and TV-out interface compliant to NTSC/PAL system. Consolidating such premium specifications, this compact and versatile system trumps all competitors on the current market. The EXC-2740 adopts ETX Computer-on-Module technology, which offers complete PC functionality and can be mounted directly to an I/O-specific carrier board. By separating the core technology and I/O into two boards, it allows flexible upgradeability by simply replacing the ETX core module with the one that has higher processing power without changing the carrier board. The development board can also be customised and expanded to best meet a company’s design needs. A mounting kit supporting one 2.5” hard disk drive can be easily located at the bottom of the casing for easy maintenance, while a CompactFlash socket with ejector in front provides alternative system reboot option. Combining the advantages of size and these I/O-intensive features, EXC-2740 is suitable for demanding applications including test equipment, medical instruments, communications devices, transportation systems, data loggers, security, gaming and industrial control systems. * 4 COM, 6 USB 2.0.